Lucky enough to live in a home with an open space, balcony or patio, but not utilising it enough? In today's blog post, we discover creative outdoor spaces so inspiring, you'd want to replicate it for yourself. If you've got a balcony space big enough to fit a dining table, then you're already winning at life. Great for conversations, especially during mealtime, a balcony with a dining table provides extra cosy options for family and friends to gather. Top this space up with lush plants, stylish decor on the table as a centrepiece, along with weather proof dining chairs, and that's all you'll really need. If you want to go further, choose an interesting hanging light instead of the standard flat balcony lights that usually comes with the property, or use our Moroccan Bird Cage filled with fairy lights or candles for an extra ambient touch in the evening. For a classic tropicana look, our Arizona Cactus Candleholders would be a great addition as a table centrepiece. So your balcony isn't big enough to fit a dining table. We feel you. This doesn't mean you can't create a space for conversation. Make sure you size up your corner hangout so all your pieces are fitted to the tee. 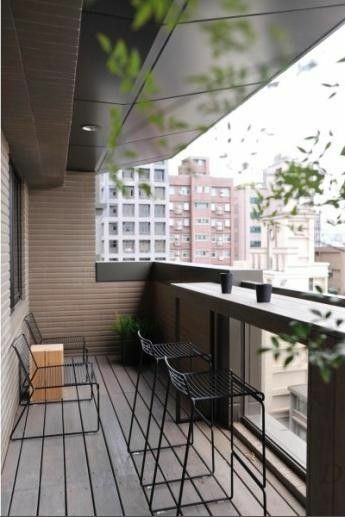 Other options can include a thin and long table to place against the balcony ledge, or one to two seaters for a place to chat and read. Top it off with corner plants using our El Dorado pot along with your priceless outdoor view, and you're all set. For homeowners with a green thumb or love the idea of urban farming, then utilising your balcony and turning it into your very own garden could be just what you need. Spruce things up by placing pedestals in different heights to place your potted herbs and plants, and don't be afraid to mix it up with geometric frames like our Open House Planter Set or terrariums for smaller succulent and air plants. A little extra space never hurt anyone, especially if you're in need of an extra study. If you're willing to bear with the renovation process, then installing windows and walls to extend your living area, or create an extra pocket could be exactly what you need. Make your balcony a work haven with our home office styling tips here! Or turn the extra space into a spare guest room below. Now with an extra pocket space, there's just so many ways you could style it so you enjoy it better. Double this space as an extra guest room by popping in a mattress littered with cosy pillows and large duvet for the ultimate sleep-over. When it's not in use, turn it into your reading and lounge space with a cosy arm chair or hammock for lazy weekends in. Bliss!